We create software that fits. Labman software is custom developed so it aligns perfectly with your existing ways of working. This means easy adoption, minimal downtime and software that works how you want it to. We also believe your data belongs to you. Whilst we use state of the art security and encryption we always ensure you’re able to access and extract your data in the format you need. Our experience and ethos means Labman Software can integrate effectively with 3rd party hardware and software to improve data flow around organisations and laboratories. Labman is an expert in connecting disparate systems. We can centralise data from disparate 3rd party hardware and software including complex lab equipment and lab information management systems. We are experts in database design and implementation and provide world class security and redundancy measures. We specialise in replacing out of date systems such as excel and Access with more efficient and effective methods of managing and storing information. 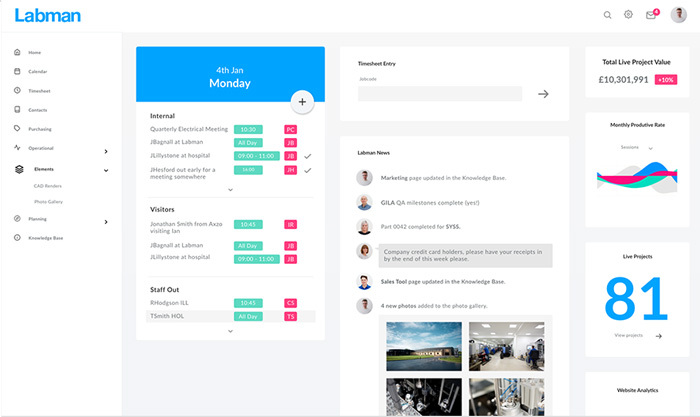 With centralised maintenance, greater flexibility and the potential for remote and mobile access web applications can be a great way to bring software to a dispersed team. We have expertise in all core Web Application technologies. We are experts in all areas of Windows development from C# to Microsoft SharePoint to SQL Server and everything in-between. We have expertise in all mobile platforms including iOS, Android and Windows; with specialisms in developing remote data collection and stock management apps. Every organisation operates in a different way. To change well established processes to fit a new IT system is frustrating, time consuming and can damage lab productivity. At Labman we develop custom software that fits with the intricacies of how your organisation really works. By understanding the detailed needs of users and managers we develop systems that are powerful yet intuitive. We do not lock your data into our software through proprietary protocols or closed data structures. Whilst we use state of the art security and encryption to secure your data we ensure you have the keys needed to extract or migrate your data when required in a format that suits you. Through the use of the latest agile work practices we ensure our software is right from conception and throughout the development and implementation process. We recognise it’s not always possible to know all required functionality from the outset and use an iterative approach to offer maximum flexibility and quality. Our experienced team has worked with organisations across the world – and many of the world’s most successful businesses and public bodies use Labman solutions thanks to our consistent quality, flexibility and commitment to customer satisfaction.